Robert Frost wrote, “Good fences make good neighbours.” And Benjamin Franklin, “Love thy neighbour, yet don’t pull down your hedge.” Fences and hedges have long been essential to getting along with neighbours. Good neighbours are those who respect each other’s privacy and property. Good parents are those who keep their children and pets safe from a busy road. And good home improvers are those who know the kerb appeal of an attractive hedgerow, fence, gate — or combination of all three. The big question is what to choose. You love the look of a dense native hedge, but how practical is that idea when you could erect a quality fence and gate in just one day? Starting with most homeowners’ top-three criteria — cost, time, and overall appearance — here are some tips to help you navigate the many options available and make the right choice for your home and family. Let’s start with the old-world charm of hedges, which date back to the Middle Ages. Farmers grew them as an effective way of housing livestock within their property boundaries. Today, hedges still hold relevance, particularly in sprawling native gardens, leafy suburbs and rural-residential areas. Hedges are fences that grow to delineate spaces, direct traffic, provide a windbreak for other plants or add garden shade during summer. They promote light during winter, reduce outside noise and pollution, and last but not least, create privacy. As a natural border that can be planted in straight or curvy lines, on rocky or undulating landscapes, the pros of hedges outweigh the cons if you are prepared and patient. The secret to success is the plant variety you choose. Find this interesting? Check out these articles too. Before you rush out and buy your hedge plant, decide where you’re going to plant it and the growing conditions, how thick you want it to look, how high you want it to grow, and how, if at all, it will change through the seasons. Unlike a man-made fence, hedges will take months, if not years, to establish. Like most plants, they require ongoing maintenance — like watering, fertilising and trimming. When choosing a variety, talk with an experienced gardener or staff member at your local nursery. The Evergreen Arborvitae is a popular year-round, thick green hedge that can be shaped neatly with shears into whatever topiary shape or line you desire. For those who want a high fence, this is a good choice, with many varieties that can grow as high as 12 metres or more. Man-made fencing is faster to establish, lower maintenance and more secure than a hedge — but it costs more. An alternative to the evergreen is an always-changing deciduous hedge that suits a colder climate and will take on a whole range of hues — from spring-green leaves and colourful blooms to autumnal gold autumnal and silvery white. The appeal of a deciduous variety lies not just in its colour variation, but also the way it lets in winter light when most needed. Suitable varieties include Beech or Hawthorn, and climbers like Wisteria and Ornamental Grape. Man-made fencing has several benefits. It’s quick to install, low maintenance and secure. Unlike a holey hedgerow, there should be no risk of children or pets escaping to confront what dangers lie beyond. The one drawback is cost, but if you put the necessary funds aside and plan well, you’ll have an asset that keeps you and your family safe while adding to the visual appeal and value of your home. As a general rule, timber, Colorbond, concrete or steel-fabricated fencing is going to be more suitable in high-density areas. You can also establish the full height of your fencing at the outset. No prying eyes or easy access or escape. Fencing is something you can do yourself. Purchase the materials from your local hardware store or timber yard. The degree of difficulty will depend on whether your block is level or sloped. The most popular types of fencing are timber and concrete block with integrated timber or steel. The exterior of your home and cost of upkeep should be considered when determining the style of fence you go for. 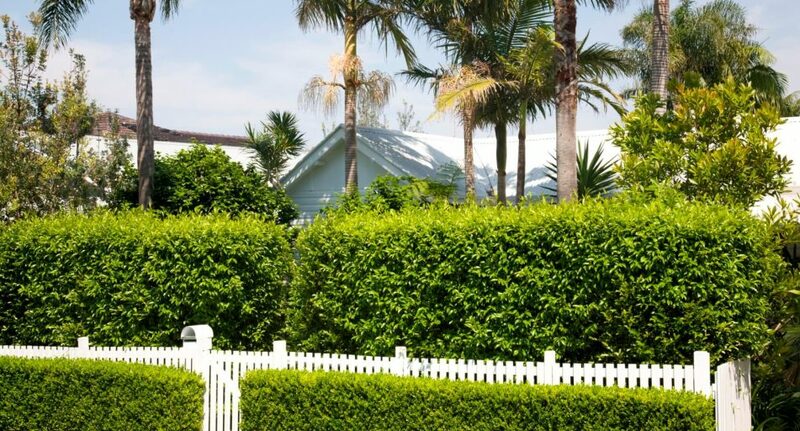 A white, painted picket fence will need more maintenance than a treated-timber or powder-coated-steel fence. An ornate, wrought iron fence may need re-galvanising and re-painting if you live in a rust-prone, coastal environment. Based on quotes from Arnel Fencing, a basic wooden fence costs an average of $35 per metre (double if you want it installed), Colorbond will set you back $70 per metre ($110 per metre installed), while a custom-designed fence can cost up to $600 per metre. According to Fraser McCulloch of Elefantus, a designer and manufacturer of custom-made gates, clients often contact him seeking a gate design after their car has been stolen. Fraser says that while most clients opt for a swing-style gate, he prefers sliding gates, which usually require only one motor. According to Fraser, the price of a custom-made gate ranges from $1,000 for a basic aluminium one to $15,000 for an extravagant statement. Homeowners typically decorate gates with different patina finishes in burnished copper or verdigris, designs like bird wings or frogs, or with a house number or surname. Automatic gates have become symbols of wealth and fame. According to an article in the UK’s Daily Telegraph, the market in gate automation is not a response to security issues but status. The number of people investing in their own electric gate is increasing around 30 per cent each year. Automated or not, a beautifully designed gate, sympathetic to its surroundings, will add value, security and privacy to your home.